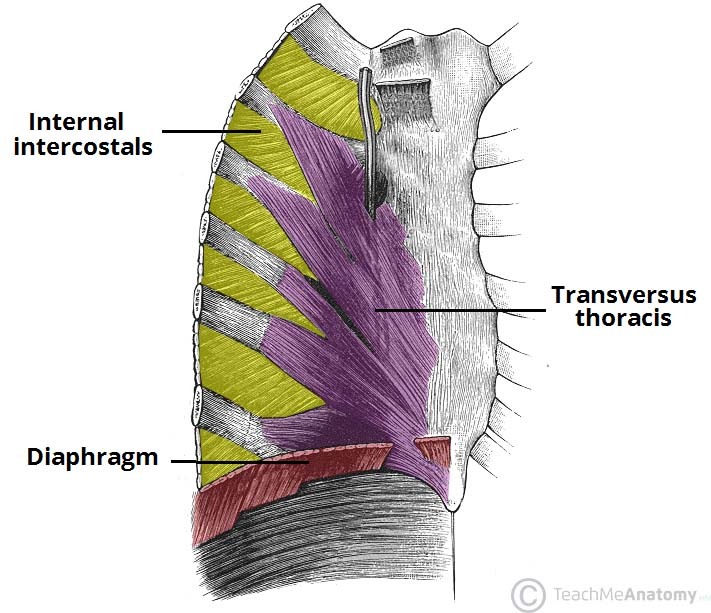 There are five muscles that make up the thoracic cage; the intercostals (external, internal and innermost), subcostals, and transversus thoracis. 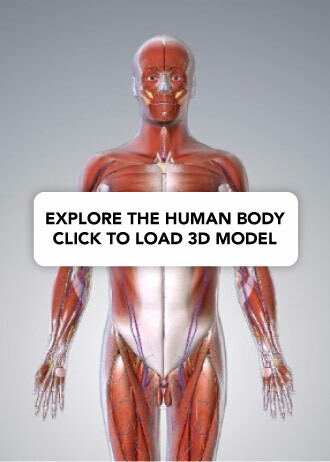 These muscles act to change the volume of the thoracic cavity during respiration. There are some other muscles that do not comprise the thoracic wall, but do attach to it. These include the pectoralis major, minor, serratus anterior and the scalene muscles. 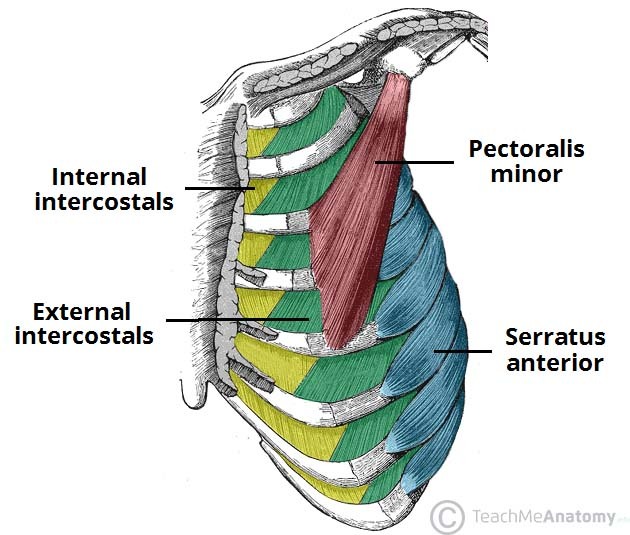 The intercostal muscles lie in the intercostal spaces between ribs. They are organised into three layers. There are 11 pairs of external intercostal muscles. They run inferoanteriorly from the rib above to the rib below, and are continuous with the external oblique of the abdomen. Attachments: Originate at the lower border of the rib, inserting into the superior border of the rib below. Actions: Elevates the ribs, increasing the thoracic volume. Fig 1 – The external and internal intercostals of the thoracic wall. These flat muscles lie deep to the external intercostals. Like the external intercostals, they run from the rib above to the one below, but in an opposite direction (inferoposteriorly). They are continuous with the internal oblique muscle of the abdominal wall. Attachments: Originates from the lateral edge of the costal groove and inserts into the superior surface of the rib below. Actions: The interosseous part reduces the thoracic volume by depressing the ribcage, and the interchondral part elevates the ribs. These muscles are the deepest of the intercostal muscles, and are similar in structure to the internal intercostals. They are separated from the internal intercostals by the intercostal neurovascular bundle and are found in the most lateral portion of the intercostal spaces. Attachments: Originates from the medial edge of the costal groove and inserts into the superior surface of the rib below. These muscles of the thoracic cage are continuous with transversus abdominis inferiorly. Attachments: From the posterior surface of the inferior sternum to the internal surface of costal cartilages 2-6. Actions: Weakly depress the ribs. Fig 2 – View of the internal aspect of the thoracic wall. The internal intercostal and transverse thoracis muscles are visible. The subcostal muscles are found in the inferior portion of the thoracic wall. They comprise of thin slips of muscle, which run from the internal surface of one rib, to second and third ribs below. The direction of the fibres parallels that of the innermost intercostal. Attachments: These originate from the inferior surface of the lower ribs, near the angle of the rib. They then attach to the superior border of the rib 2 or 3 below. How many pairs of external intercostal muscles are there? Which of the intercostal muscles work to elevate the ribs? Transversus thoracis extend from the inferior sternum to the internal costal cartilages of which ribs?